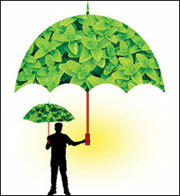 ON MAY 25, the Union Ministry of Environment and Forests (MoEF) released the draft Green India Mission. It aims to reduce carbon emissions by doubling the area taken up for afforestation in the next one decade as a part of the Centre’s climate change action plan. The ministry said the mission would prevent greenhouse gas emissions equalling 43 million tonnes CO2 annually (see box). The government has earmarked Rs 44,000 crore for the mission; more funds would be raised from schemes such as the UN’s REDD programme (reducing emissions from deforestation and forest degradation). Ten million hectares (ha) would be covered by existing schemes of the forest department like the compensatory afforestation. The mission plans to afforest another 10 million ha. Scientists said pressures on land could hamper the programme. “The National Remote Sensing Agency estimates there is 40 to 50 million ha of wasteland that could be used for afforestation. But a study we did in Karnataka found that wasteland earmarked for plantation was used as grazing land by the community; they also wanted to build a school in that space,” said N Ravindranath, professor at the Indian Institute of Science in Bengaluru. The mission has set a target of regenerating four million hectares of degraded forests and increasing density of two million ha of moderately dense forests. Forest areas for conservation will be chosen based on their vulnerability to climate change, fragmented forests, for instance, and potential for carbon sequestration. “This classification is acceptable if one looks at forests solely as carbon sinks but what is also important are the larger ecological functions of these systems. Classifying degraded forests then has to consider parameters like species diversity. There shouldn’t be a trade-off between carbon sequestration and biodiversity,” said Ravindranath. The mission’s focus will not be on just planting trees, said K B Thampi, inspector general (forests). “Plantation will be done only where feasible, the rest is about protection, conservation and sustainable management,” he said. The mission also deals with community management of natural resources through gram sabhas, van panchayats and joint forest management committees (JFMCs). The mission proposes JFMCs to aid gram sabhas in the Fifth Scheduled areas where tribals live. But the Panchayat (Extension of Scheduled Areas) Act says gram sabhas (only) would manage forest produce. Madhu Sarin who works on forest rights issues said bringing JFMCs into scheduled areas is forest department’s way of retaining hold over management of resources. Thampi said the details of the mission are yet to be worked out. The mission will be monitored at local and central levels. The draft is open for public comments.